In this guide we will show you how to install TomatoCart using the Softaculous installer. TomatoCart is an open-source Shopping cart system that is designed to be compatible with all digital devices. This is important, since people are increasingly surfing the web with devices other than laptops, and PC's. Here is a link to the Official TomatoCart site. Click the Softaculous button in the Software/Services section. Locate TomatoCart in Softaculous via the search tool. Select how you want your web address to load , options are: http://, http://www., https://, https://www. For the https options, you must use an SSL. Click the drop-down box, and choose from your Primary, or Addon domains. Enter a name for the database that will be created during the installation. Give your store a name; this can be changed at a later time. Provide a name for the Store Owner here. The text you enter here will be added to the table names in the database, helping you identify them. The name you enter here will be used to login to the administration section of TomatoCart. The password you enter here will be used to log into the administration section of TomatoCart. The email address you enter here will be contacted for things such as password reset requests, or update notifications. Clicking the + symbol here will provide an option to Disable Update Notifications. Check the box if you do not want to receive update notifications. The installation will begin, it may take 3-4 minutes to complete. The process is complete when you see a message stating "Congratulations, the software was installed successfully." 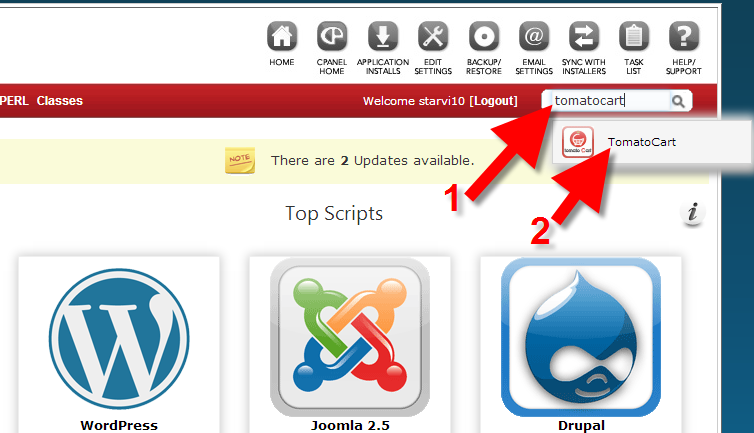 Congratulations, now you know how to install TomatoCart using Softaculous in cPanel!